How lack of attention decreases productivity? It was 1924, the location a factory in the suburbs of Chicago, where several researchers have just begun an experiment in an attempt to answer the question: does better lighting enhance worker productivity? They dramatically improved the lighting in the work area for one group while leaving the lighting unchanged for the second group. To the surprise of the researchers, each time a change was made, worker productivity increased, even when the lighting was returned to its original, unfavorable condition. They extended the study until 1933, and regardless of the conditions, whether there were more or fewer rest periods, longer or shorter working days, any change made the workers more efficient. These experiments were conducted for the most part under the supervision of Elton Mayo, who was a sociologist and professor of industrial research at Harvard. His team concluded that it was not the changes in physical conditions that were affecting the workers' productivity but the fact that someone was actually concerned about their workplace, and the opportunities this gave them to discuss changes before they took place. This effect was first referred to as the "Hawthorne effect" by J.R.P. French in 1953, based on the name of the factory. Hawthorne Effect (Oxford English Dictionary): an improvement in the performance of workers resulting from a change in their working conditions, and caused either by their response to innovation or by the feeling that they are being accorded some attention. In 2015, as a research team, we conducted a study to assess the workload of 104 office employees. All the employees used computers for 30-70% of their worktime. They worked in the departments of accounting, customer service and administrative support. Our goal was to assess the workload level for each job position. The main problem was to standardize one KPI to cover all departments without going too deep into the details. The quantity indicators generally used in such cases only formed a basis to check the correctness of the study results. 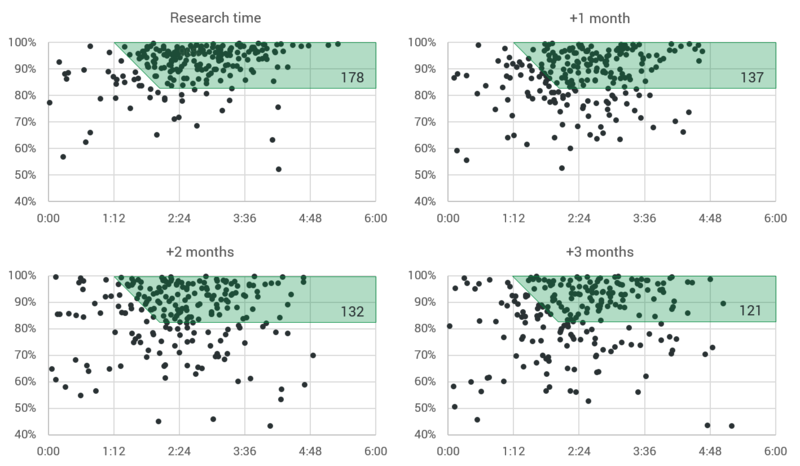 Data analysis — provided by the Lab1 system, which covered all computer activity with insights like activity level, type of activity, distraction level, pace, activity experience and more. Surveys — to obtain an employee self-assessment, to understand what motivated them the most and to learn what would they change. Interviews with managers — to compare managing styles, confirm data results, and check the conclusions about employees. Once the technical preparations for the study were complete, we arranged a meeting with the employees and managers. We described the project goals in terms of making changes to improve work efficiency, but we said little about the chosen methodology. We collected the data for six weeks before beginning to analyze them. We were surprised that the first indicator showed an almost 90% level of average workload for each position (quantity of time spent directly on duties compared to the total activity time). This was an unlikely outcome, according to the earlier interviews and surveys. While seeking the reason for such significant results we decided to compare the data from the research period with the data collected during the system tests undertaken about five weeks earlier. These results are shown in Figure 1. The average productivity level before the research period was 16 pp lower than during the research period. Was the research the only factor for such a change? Completion of the first study left us unsure whether this was an isolated case or a regular feature. We decided to organize a number of more extensive studies from which, over the next two years, we gathered data about several thousand job positions. We obtained similar results from almost every organization that took part in a study. Based on this experience we prepared the short research study shown below. This included data from four organizations and a total of 221 employees, sufficient to make a number of comparisons. Each of the selected companies were studied for at least three months as the 'research period' followed by a further three months as the 'comparison period'. The timeline for the productivity indicator is shown in Figure 2. 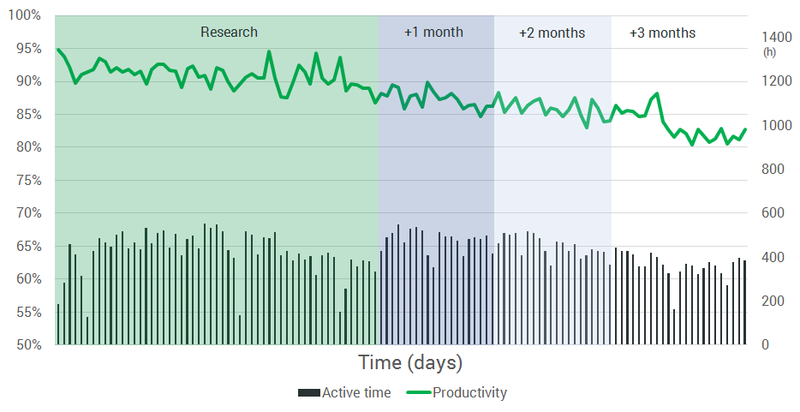 The productivity decreases after completing the research period, with the result continuing to deteriorate as time passes. The decrease is not as large as in the first example (16 pp), but the change is clearly visible. To understand this effect better we need to examine the results of individual employees. It is interesting to note that the decline in overall (average) productivity does not affect all employees. Figure 3 shows the individual results related to each period. 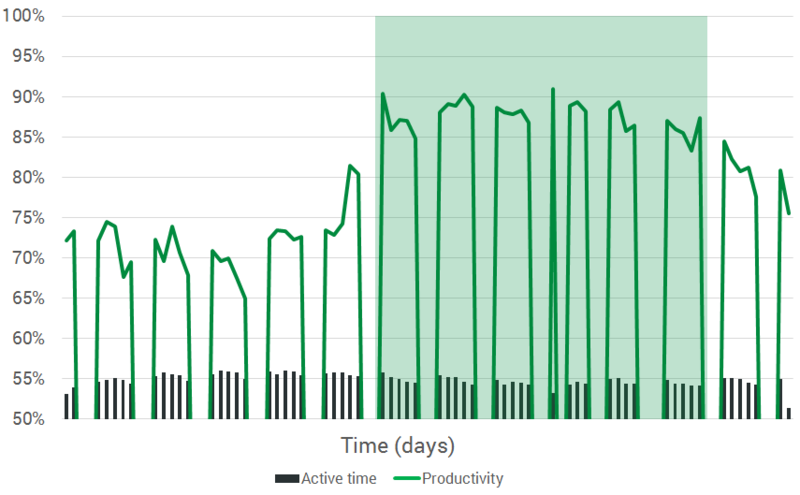 The area marked in green shows the desirable results, defined as a high enough productivity level over a specified activity time. During the study period 178 of the 221 employees remained in the green area (80.5%). At the three month point after end of the research period only 121 employees were still achieving desirable results (54.7%). This indicates that the huge reduction in productivity is primarily the result of one third of all the employees! Research on the Hawthorne effect has been repeatedly undermined. Despite this, it has become a very popular management theory, possibly because we all feel more motivated when someone pays attention to what we do. The reactions of the employees were similar and were the result of conducting the research, even though we did not clearly explain what we expected from them. Such behavior confirms some of the conclusions obtained from the Hawthorne study, but should also be considered in the context of demand characteristics. The easy to observe decrease in productivity was made by one third of all the employees. This means that we need to understand the correlation between this type of decrease and its causes. Only then can we achieve significant improvements. The survey and interview results seemed to confirm that lower levels of attention to employees correlates with quicker productivity reductions. The most efficient way to give employees attention is to give them real responsibility for their duties. This means not only internal responsibility but, potentially, external as well. The larger the company, the more difficult this is to achieve. This is why departments like accounting or administrative support need more attention from direct managers. Attention can be given in different ways: by providing research to help people grow, by providing some performance indicators that allow people to shine (and let them know how they really perform), by individual care from the managers or, even more informally, by creating a good team spirit without any official interruption. There is no single best way, with companies needing to look for their own way; however, they should never forget about paying attention! This can cost more than the equivalent of 10% in salary payments each year, higher employee rotation levels and much lower total company productivity. Need to use our data? Levitt, S.D. & List, J.A. (2011) "Was There Really a Hawthorne Effect at the Hawthorne Plant? An Analysis of the Original Illumination Experiments"
Draker, S.W. "The Hawthorne, Pygmalion, Placebo and other effects of expectation: some notes"
The Economist (2008) "The Hawthorne effect"
Kolata, G. (1998) "Scientific Myths That Are Too Good to Die"